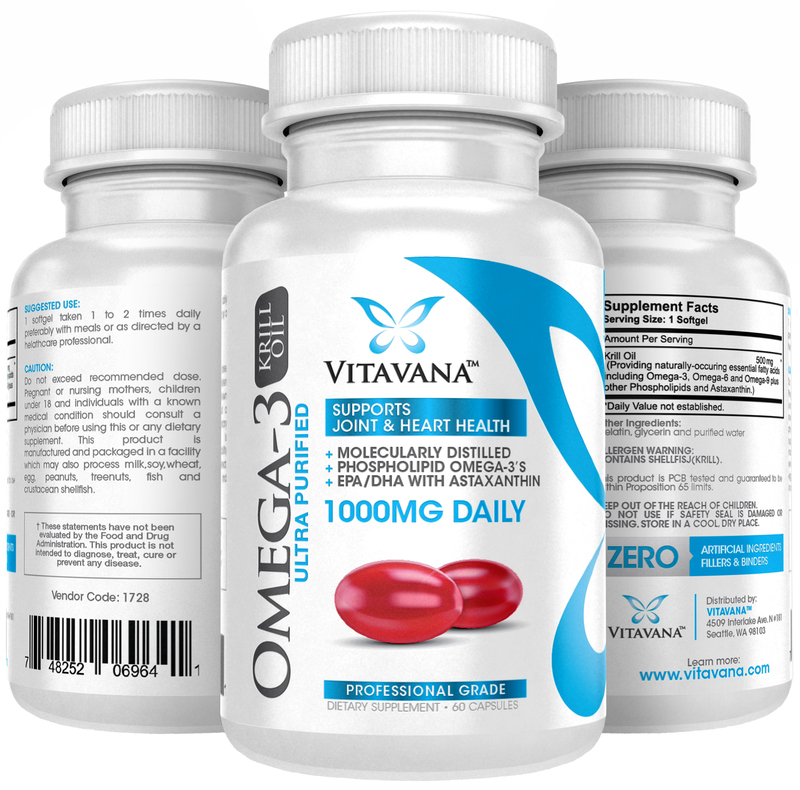 Omega-3 fatty acids, in general - abundant in Vitavana Krill Oil - have been shown to slow the rate by which our body ages at the cellular level -- thereby reducing inflammation, easing joint pain, improving cardiovascular health, eye and skin health, and brain functioning. A diet rich in the essential fatty acids (EFA's) contained in Vitavana Krill Oil can increase your health and well-being. Vitavana Krill Oil fatty acids are vital to nervous system health, ensuring all body systems and brain functions run smoothly. Krill are a type of shrimp-like marine invertebrates and are a common food source of baleen whales, manta rays, whale sharks and numerous other marine animals. The oil derived from Krill is rich in phospholipids, the building blocks for cell membranes, and Essential Fatty Acids including Omega-3, 6 and 9. Krill Oil is very stable, free of heavy metal content and considered more efficient in the body than regular fish oil capsules. Vitavana's Krill Oil delivers a potent 500 milligrams of purified Krill Oil in every easy to absorb soft gelatin capsule. I love taking my omega's. Especially as we age. And I don't eat near as much seafood as I once did when I lived in Alaska. As you read above it is an amazing supplement. I doubled up on it because I suffered the hives this week. And taking more fish oils soothes the healing process of any skin condition. Okay now let me tell you some more scientific facts about krill oil. An amazing oil! I will always take it over regular fish oils. Plus I do try to eat fish 3 or more times a week.